Som namnet antyder är färgerna i detta färgkitet utvalda för att måla skrämmande varelser... Kitet innehåller 10 flaskor airbrushfärg á 28 ml samt tips från Steve Rojas. "The different flesh colors are meant to be a starting point. The mixing and matching of any or all of the colors is limited only to your imagination! To paint a classic horror character such as Frankenstein’s monster, you can begin with a base coat of Green Flesh. Then, using a small mixing cup or even your Iwata airbrush cup, add a few drops of Flesh and a couple of Bone White to lighten the original green color and spray on as highlights. 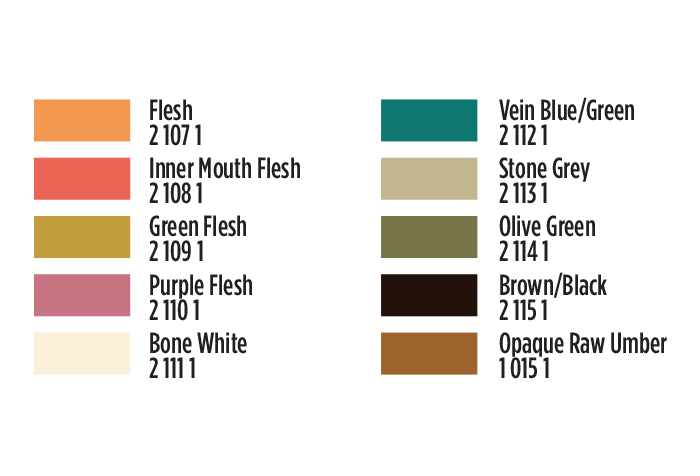 To shade, you can either mix Brown/Black into the original green or Stone Gray for a more subtle approach. Redness around eyes and scars are easily achieved with Inner Mouth Flesh which, by the way is perfect for, you guessed it, the inner mouth! These monsters always seem to have bulging veins and Vein Blue/Green is the color straight out of the bottle for the most striking look or mix with various flesh colors for an “under the skin” effect."